Discussion in 'SimTools compatible interfaces' started by nclabs, Jun 19, 2014. 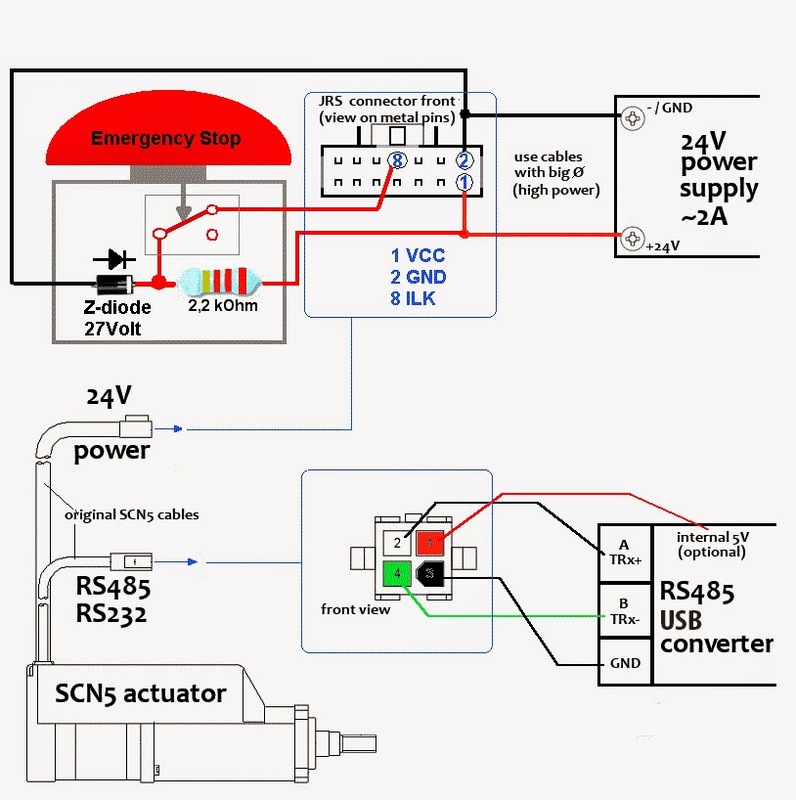 This is a tutorial for explain what you need to correctly wiring two SCN5 to your simulator. a) A frame structure to hold everything togheter. b) Two or more electric/pneumatic actuators. The quality, the speed and the acceleration of the movement depends on these elements. Please, keep in mind that a not satisfying movement quality of you simulator, can be caused from any of these elements (a correct wired system it's ok, but, if you put it on a wrong seat position or wrong junction leverage, it's useless). In this guide we focus only on the electric components that a two SCN5 or SCN6 motion simulator needs to run correctly. For an electronic expert (you can find the official SCN5 & SCN6 manual at this link), this diagram and examples might be enough, but let me talk through that. It's a very common electric linear actuator. They are quite expensive (if we compare it with a worm gear worm geared rotary actuator) but it's very very fast, very reliable and easy to get it work. Dyadic produces several models of the SCN family, with different thrust power, different stroke lenght and different maximum speed. The most common one it's the SCN5 with 100N of max thrust, 100mm of stroke and 400mm/s of speed. The SCN6 family it's the more powerful one, they can lift heavy loads (up to 60 kg each), but the acceleration and the speed drops down. NOTE: With the 1.3 version of SimTools SCN6 Actuators are supported. In general, faster and more powerful it's always better (you can always slow them down by tweaking the software) but the stroke lenght depends only from the kind of frame, joint and junction you chosen for your sim. Some need long stroke, others need short stroke. Choose wisely! Both SCN5 and SCN6 runs with 24 Volts current but the amperage may differ from model to model. I always advice to consider 2 Amps for each actuator (SCN5), it might be more than needed but I've seen the issue that come from a low powered actuator, and it's not a good thing. This is a fondamental part of the simulation system, every signal coming from the PC needs to be manipulated by this electronic device to reach the actuators. The "RS485"is a standard defining the electrical characteristics of drivers and receivers for use in balanced digital multipoint systems. It's basically a kind of serial (old style) communication. This it's a fairly simple device and there are many models from many manufacturers that can work properly. 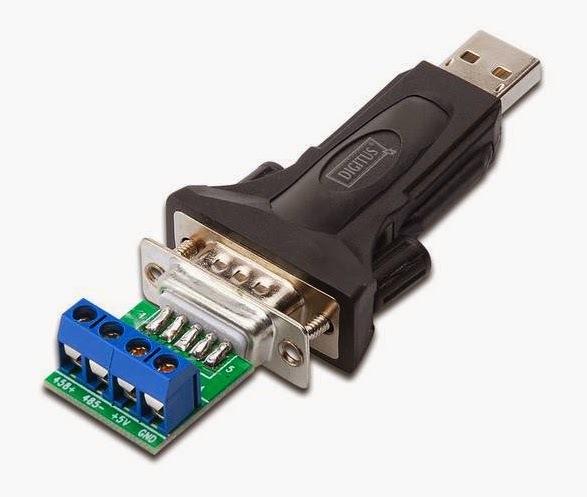 You can use a RS485 to USB Converter, or a RS485 to RS232 to USB/SERIAL Converter, in the second case you need two different converter, the first one to convert the RS485 signal to RS232, and the second to convert the RS232 signal to the computer, through a USB or PCI card. However I recommend the simpler RS485 USB Converter, because simpler is better. Always remember to install the drivers for the converter (you should find it in the CD in the box, or on the manufacturer website), very rarely you don't need to. Since you will need two converters, you can plug in both on a USB HUB, but use that HUB only for the converters (! ), every other device connected to it may cause issues. I recommend to use a 4 port HUB (maximum) with a separate power supply. I recommend to avoid those HUB with no external power cord because a long USB cable can be a problem for feeding the HUB, and this cause a lot of issues. Unfortunatly not every HUB will work good enough, and unfortunatly it's hardly predictable which one will do the job. Keep in mind that there are many low quality/low cost HUBs, I recommend to avoid those as well. This one too it's another fondamental component. The reliability of the whole system depends on a good quality power supply, it's true for your motion simulator and for your personal computer too. You can find on the internet many manifacturers producing power supply of any kind and any cost, but as always, I recommend to avoid the ultra low cost products, it's for your own good. This is an optional part, and it's what is needed for "killing" the actuators for safety reason. You can find this kind of button in every proper shop. After connecting the converters to the computer, and install the drivers, and disconnect those again, the wiring will be easier. Now we can start the actual work. The actuator has two cable, one squared with 4 pins for the signal, and the other flat for the power with 14 pins. Actually, there is another case though, if you have purchased a SCN5 from a reseller that use SCN5 actuator for their Motion Simulator, it's possible that you will find a completely different cable (like simXperience). In that case you have to search for a technical sheet and work out the ID number of the pins, and use that for reference. If you have some problem with the technical sheet, you can always open the plastic enclosure, and find the original connectors. In this way it's quite easy to trace the right PINs and proceed accordingly. On your USB Converter, you can find different kind of connector label, it depends on which model of converter you have. Anyway you can always find written on the contacts, or on the technical sheet of the converter, which pin is the negative/TRx- (sometime you can find only the symbol "-"), the positive/TRx+ (sometime only "+") and the ground/GND. Some models have just 3 pins, others have 4 pins, anyway it doesn't really matters, you can skip the 5V pin. For the wires connection you can weld the wires on the connector's pin or strip the back wire to reconnect it where you need. It will achieve the same result, choose the solution that will be more comfortable. OPTIONAL) PIN1 to the 5V PIN on the converter, but it's not needed, so I recommend to skip this step. Once you did that on the first actuator and the first converter, do the same thing with the second actuator and the second converter. Now we have wired the signal part of the tutorial and we can deal with the power one. Obviously, dealing with electric power, you have to take every safety precautions needed, and if you are not an expert of electrical devices, or a professional electrician, you need a supervisor that can avoid every dangerous mistakes that can happen. Look again to the diagram at the start of this page. You can find the second connector, the flat one, it's named "JRS connector". For SCN5 you will need only 3 PINs for this procedure, in order: PIN1 (VCC), PIN2 (GND) and PIN8 (ILK) and for SCN6 you need PIN1 and PIN3 (VCC), PIN2 and PIN4 (GND), PIN12 (ILK). a) Use a "kill switch", connecting a Emergency Stop Button on the power line. b) Use a simple on/off switch. On the diagram you find the kill switch solution, but I will explain briefly the on/off switch as well. a) First of all, keep the power supply UNPLUGGED FROM THE ELECTRIC POWER. DO NOT PLUG IT IN UNTIL YOU REACH THE RIGHT STEP. DO NOT SKIP THIS STEP. In the kill switch you will need all three PINs. In this case, the diagram does a better job explaining what do you have to do, just follow it. Be sure that you connect the PIN1 to the +24V line of your power supply, PIN2 to the -Ground (GND) line. Don't forget the 2k2 resistance between PIN1 and PIN8 (ILK). b) First of all, keep the power supply UNPLUGGED FROM THE ELECTRIC POWER. DO NOT PLUG IT IN UNTIL YOU REACH THE RIGHT STEP. DO NOT SKIP THIS STEP. For the on/off switch connect the PIN2 to the -Ground (GND) of the power supply, then connect the PIN1 to the +24V line and place a 2k2 resistance between PIN1 and PIN8 (ILK). Now you can add an on/off switch to the power input of your power supply (there are many ways to do that, pick your favorite) and it's done. Once you did that, you can plug the USB Converters to the PC (through a USB HUB, if needed), check if your power supply have a 220V/110V mode, set it to 220V (if you are using normal european electric power) and, WITH CAUTION (do not take any risk! ), you can PLUG THE POWER SUPPLY TO THE ELECTRIC POWER. You can do that using a normal power cord, connecting that to the input PINs of the power supply, and ONLY AFTER that, plug the cord to the power. Now you should hear a little "rumble" coming from the actuators, that sound means that the actuator are correctly powered. With this last step you have successfully completed this tutorial. Now, you can setup the software on your PC and verify if everything is working. Is somebody interested for an Italian translation of this tutorial? Nice write up, just don't agree with your comment about worm gears. "It's a very common electric linear actuator. They are quite expensive (if we compare it with a worm gear worm geared rotary actuator) but it's very very fast, very reliable and easy to get it work. " SCNs are common, but here in Australia they cost a bomb. And yes they are more expensive than a worm gear motor. As for speed, well, SCN can be rated at 400mm per second if running flat out, but that can lead to breakages of internal pins and that can cost heaps to get fixed. Thats why the likes of Simx run its units at about 200mm per second to save breakages. DC motors on JRKs with a 40mm ctc lever converts to about 300mm per second speed in 65mm throw up and down. Still SCNs can be cheaper elsewhere in the world, so this guide is a good one. @bsft really? I didn't know that! I compared just the costs of both solution, and that is totally a point for the wormgeared. However I run my SCN5s almost flat out and they're still running flawlessy after two years! I hope they will last for many more years! Thats ok, SCN are good product and you have proved their reliablilty. what about those snc5/6 actuators from Japan (Frex for instance) ? do they work according to the same wiring ? Well your lucky, one of my late SCN5 brocke up after 3 month of use, that's why I changed to SCN6. since 2 years they work flawlessly. If I understand correctly, the wiring in the tutorial should be applicable to PNP type, for Japan version, the ILK pin should be connected to 0V. With the low Yen pricing is nice. On a related note, make sure the COM ports of the USB->Serial adapters are set at <COM10 because SimTools 0.1.3.0 IGNORES any choices above COM 10.
that is right i found it also the hard way. Will this work for RS485 USB converter? I saw them at Amazon also. Nice post. I am planning on using the SCN6 linear servos for a client of mines motion simulator. I noticed in the documentation they suggest that they can be configured in multidrop RS485 mode, so in theory you should be able to get away with only one RS485 USB converter. But I doubt SimTools supports this? Has anyone tried? Also in Australia you can purchase the Dyadic SCN5 and SCN6 servos from Motion2Go for fairly reasonable pricing. [Edit] Sorry guys the website I was thinking of was Servo2Go which is American but do ship to Australia. hello could you post a precise site adress of motion2go ?